While no two FinKraft Italy Camps are alike, the general outline of each follows a similar formula. 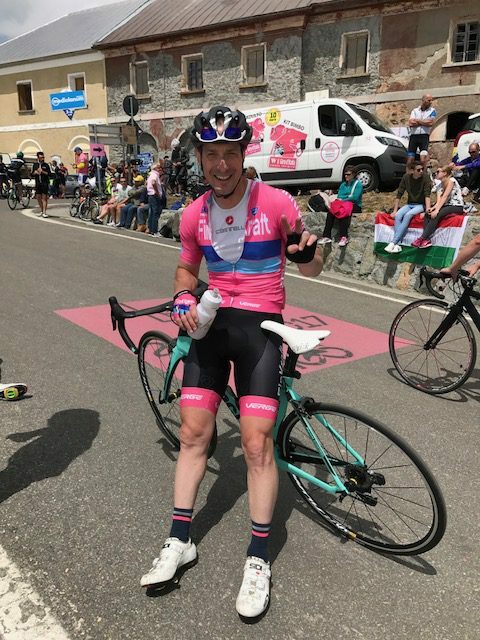 Last year it was the 101th Anniversary of the Giro d’Italia which was a fantastic experience all around – perfect weather and and amazing route and group of guys. This year it will be the 10th Anniversary for our FinKraft Giro/Italy Camps. Each year our travels take us to the northern regions of Italy—close to the Dolimites—where we will be riding on legendary routes that the Giro d’Italia and other classic road races such as the i’l Lombardia have traversed. Given that the camp takes place in May—the same time as the Giro d’Italia—we make it a goal each year to watch and ride at a stage or two of that year’s route. In years past, this has included iconic climbs such as the Stelvio,Passo di Gavia and Mortirolo. Additional events in years past have included trips to the DeRosa and Bianchi bike factories. To enjoy and be able to complete this camp, I would recommend all riders to be a Cat 3-4 level at a minimum, with a good fitness base and bike handling skills , it is not required to be a racer though . Recommended gearing would be a compact crank-set or at least a 27-28 cassette. Total riding time will be at least 32 -35 hours or 650-700 miles in 9 days with some extremely challenging climbs and narrow roads. Please do not let these facts scare you though. It is not a race and you will have the ride of your life and a trip that you will never forget. Those who have been to our FinKraft Cycling Camps before know that there are few places that rival the uniqueness of Italy. 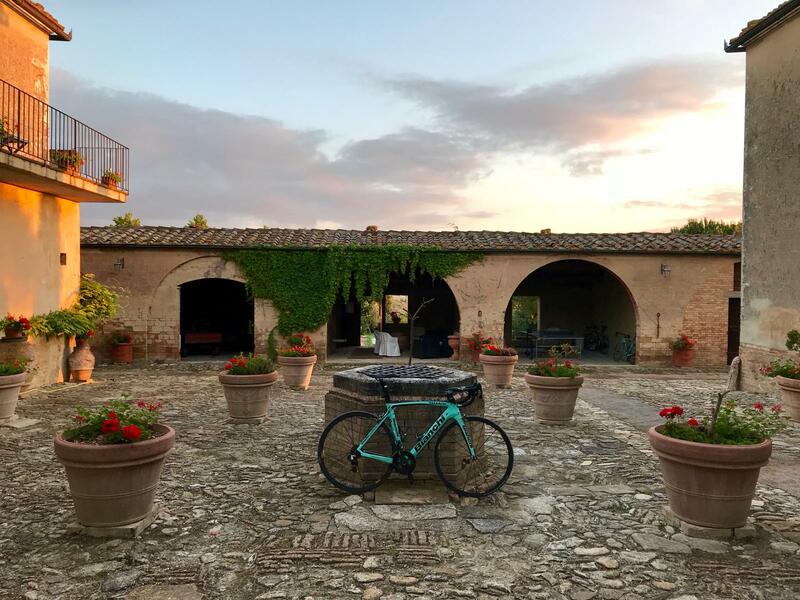 With beautiful scenery, magnificent roads, incredible food, and a well-established bicycle culture Italy is an ideal location to host a cycling camp. Here at FinKraft we hope you can join us for this unique experience that we promise you will never forget. Our annual Finkraft Italy Cycling Camp is always dedicate to my dear friend Paolo Zenoni. -Deposit ; $ 500 to secure your spot on this amazing cycling camp. Refundable until May 1st 2019. All camp fees has to be paid in full by May 1st as well . -Also included is a special Italy FinKraft cycling kit. High end rental bikes are usually available for this camp at about 125 euro for the 9 days we are there. You would need to provide sizing and measurements prior to departure, but this option makes travel a lot easier, but your are of course welcome to bring your own bike too if you like . Friday: (May 24th): Depart from the USA. Saturday: Arrive at the Malpensa ( NOTE : MXP ONLY) airport in Milan the next morning between 8.00-10.00 am. Bus transfer to the hotel, note only one pick up trip .The location of our base hotel Cascina Belvedi is right in the heart of the perfect cycling mecca where many pros choose to live and train, we could stay here the whole week and it would be a beautiful different route to ride every day. When we get to the hotel we will have lunch and a short nap or just relax a little. 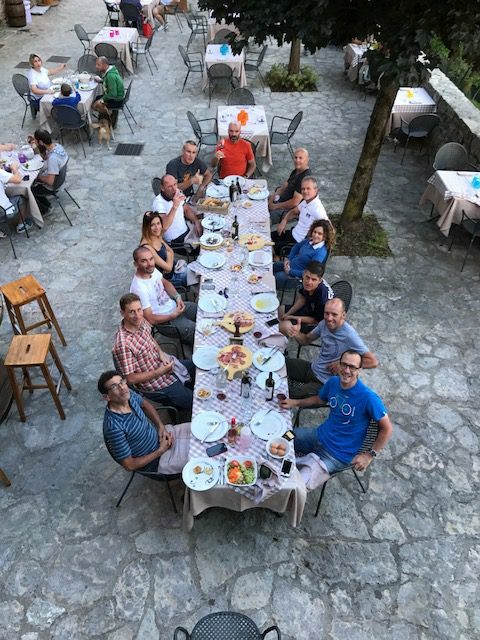 At around 1.00-2.00 pm either pick up bikes from Salvi Bikestore or assemble our own if you do not choose the rental option followed by a short and easy ride in the valley short ride leaving 3.30-4.00 pm 20-25 miles, just to shake the legs out.Dinner at Cascina Belvedi , I have been waiting for this for a whole year now -;) Go to bed at a normal time to get on Italy time schedule. Sunday: On May 25th will be our first big ride and this year it is already Giro time.This route is one of the most famous rides in this region Madonna di Ghisallo ride which mounts to be about 100 miles.We will include of course Muro Sormano and will be our spot to watch stage 15 of the 2019 Giro d’Italia. This wall ( Muro ) also featured in the Il’ Lombardia race in recent years. 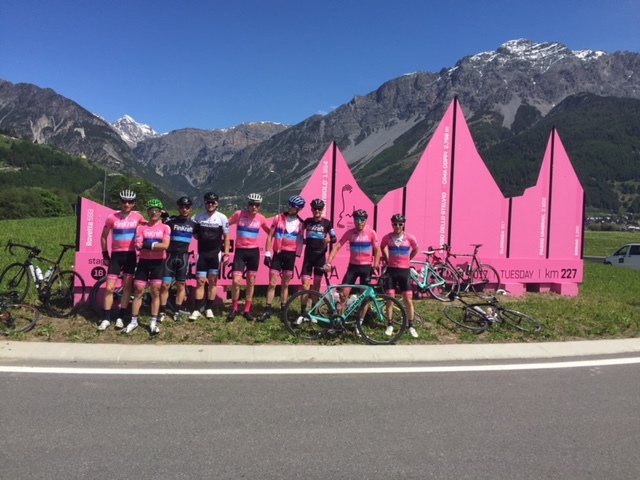 Plenty of photo opportunities here and lunch at the Madonna di Ghisallo by the cycling museum and church is a big tradition for our camps every year. This is also for sure one of my most favorite rides/routes right out of the Hotel. This was Paolo’s training grounds as well and the area where he grew up and lived. Monday: Pretty early departure from Cascina Belvedi and transfer day into the mountains. Yes , there will be a follow van with our luggage , but we will be riding our bikes. Destination will be Aprica via Passo San Marco. Wednesday: Passo Tonale will be our fist big climb . Then down the valley ( Val di Sol ) to Dimaro into our 2nd climb of the day , Madonna di Campiglio down to Pinzolo. Bagolino will be our destination tonight at the base of Passo Manvia and Croce Domini . Thursday: Via will have some amazing back roads and hardly any traffic or cars for the whole day today Passo Manvia from Bagolino , around the Croce Domini pass to Breno . Some big climbs 1800+ meters still in the Lombardy Region . Back home to Cascina Belvedi , Clanezzo today and dinner again at our favorite place . 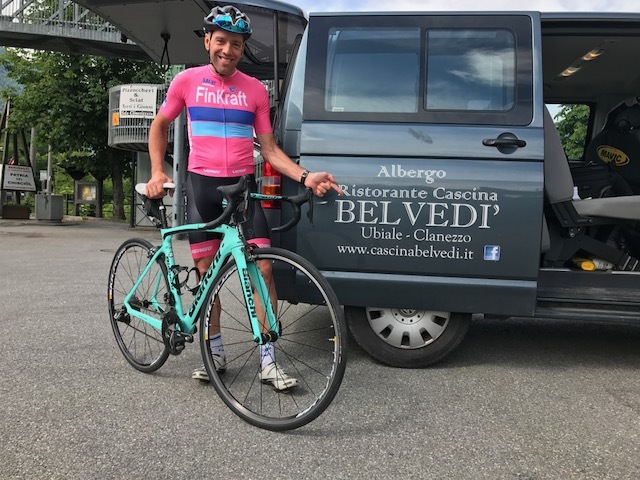 Friday: Today we will have a slight recovery day and do a shorter ride near Cascina Belvedi , possibly a Bianchi factory visit in the afternoon as well . Saturday: Today we will do a really cool and scenic route to Lecco and climb Mortirone , back via Culmine San Pietro. Sunday: Last ride in Italy for us and we will start off with Valcava ( a beast of a climb. We do not always get to do this one, but this year you are lucky) and then head over to Passo Bura, where we will make our traditional stop at our friend Tulia’s coffee shop for some cake. Then via Talleggio valley ( where they make some very famous cheeses ) to San Giovanni Bianco, just North of the San Pellegrino the water company you all know . We are now in Brembo Valley. Little more climbing to Dossena and then via Serina along the ridge with a very beautiful view of the valley . 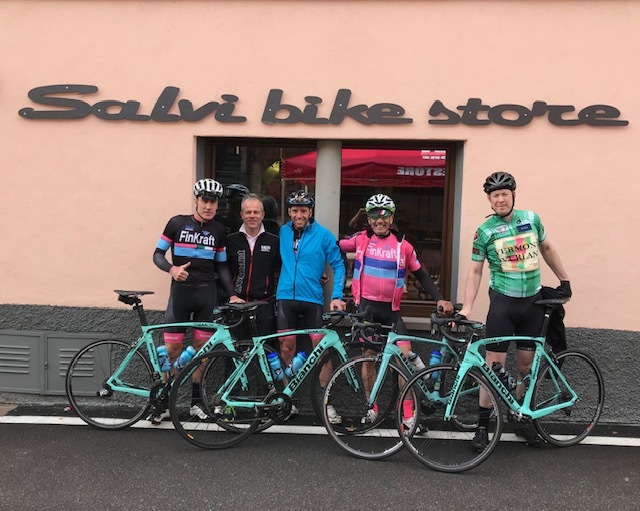 Time to head back to Zogno and back into Italy where the Salvi Bikestore is located and return the bikes if rentals and back to the hotel. Tonight is also time to pack and eat our last dinner in Italy, hopefully some more Casoncelli and Tiramisu. Route and schedule has to be flexible due to weather and can be changed as we go , this years route will be as epic as any other year with some new climbs and roads to explore for our crew. Monday (June 3rd): Am bus transfer to the Malpensa ( MXP) Airport in Milan. Departure time from the hotel around 5.00-6.00 am, so schedule your return flights to depart 8.00 am or later if possible. If you have different travel plans you are responsible for your own transportation to the airport.